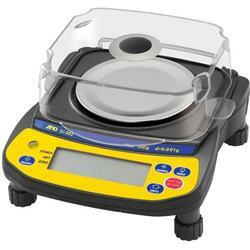 The EJ series are high-resolution type electronic balances having a display resolution of 1/12,000 ~ 1/60,000. The balance has a counting function, % function and a comparator function. The backlight LCD will help with use in a dimly lighted place. The balance can be operated with an AC adapter, or 4 x “AA” size dry-cell batteries for cordless operation. The optional RS-232C serial interface can be connected with a printer or personal computer, and Good Laboratory Practice (GLP) data can be obtained. The optional USB interface is available to connect with a personal computer easily.